Encyclopedia of Protestantism, Second Edition explores the movement that began in Europe in the 16th century, established itself in opposition to the Roman Catholic Church, spread around the world, and today lives on in thousands of individual denominations and parachurch organizations. 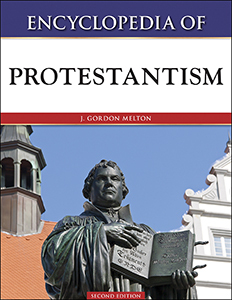 A comprehensive encyclopedia on Protestantism, this invaluable reference covers its history, concepts, people, events, and major organizations worldwide. Applying a broad definition of the term Protestantism, coverage includes the Reformation churches, the Protestant-like churches that predated them, and the Free Churches. A special effort has been made to also include those parts of the world in which Protestantism did not take hold until the 19th century, such as Asia, Africa, and Oceania. A bibliography, a chronology, and photographs complete this valuable resource. J. Gordon Melton is distinguished professor of American religious history at the Baylor University's Institute for Studies in Religion. He is founder and director of the Institute for the Study of American Religion in Santa Barbara, California. Melton holds an M.Div. from Garrett Theological Seminary and a Ph.D. from Northwestern University. He has been a teacher or lecturer at the University of San Francisco, the Garrett-Evangelical Theological Seminary, Loyola University in Chicago, and the University of California at Santa Barbara. Melton is the author of American Religions: An Illustrated History, The Encyclopedia of American Religions, Religious Leaders of America, and several comprehensive works on Islamic culture, African-American religion, cults, and alternative religions. He has written or edited more than three dozen books and anthologies as well as numerous papers and articles for scholarly journals. He is the series editor for Religious Information Systems, which supplies data and information in religious studies and related fields. Melton is a member of the American Academy of Religion, the Society for the Scientific Study of Religion, the American Society of Church History, the Communal Studies Association, and the Society for the Study of Metaphysical Religion.